Dental irrigation or oral irrigator is devices use to remove plaque and debris between the teeth. This process is done by using stream of pulsating water which release from the tip of dental irrigator. Recently dental irrigator is gaining recent appeal and increased use in homecare aids especially for patients with periodontal diseases. Over the years, dental irrigation devices were mainly recommended to the orthodontic patients as the brackets prevent from cleaning teeth properly. People with sensitive gums, diabetes, dental implants, sensitive gums, orthodontic appliances and non-compliance, dental irrigation devices are effective to use. The primary purpose of dental irrigation devices is to reduce harmful bacteria and reduce risk of periodontal disease. Dental irrigation devices has demonstrated a significant reduction in gingivitis, periodontal disease, bleeding and probing depths. Dental irrigation devices used in daily routine works by directing high pressure from the nozzle. Commonly the devices comes with build in pump which generates the pressure and other devices attached to water faucet. Dental irrigation devices have proven to reduce overall amount of bacteria which increased risk for developing gum disease, help control gingivitis, remove 99% of plaque, reduce incidence of gum bleeding and improve bad breath. According to centers for disease control and prevention (CDC) 47.2% of American adults have mild, moderate or severe periodontitis. The prevalence rate for periodontitis disease has increase to 70.1%. Growing trend of using dental irrigation devices in many countries, awareness about the various dental disease, and others are some of the factors expected to fuel the Dental irrigation devices market. Increase awareness and adoption of dental irrigation devices drive the market of dental irrigation devices in near future. Among all the product type, cordless dental irrigator contributes to the largest share in dental irrigation devices market owing to increase use in homecare and travel purpose, portable and easy to use and cost effective devices. Oral hygiene has become important parts which health to avoid dental problems. Periodontal and dental caries disease are the condition which affect majority of population. Increasing demand of use of dental irrigation devices and widespread implementation of advancement in the technology will significantly drive the market of dental irrigation devices market. On the basis of regional presence, global dental irrigation devices market can be segmented into five key regions viz. North America, Latin America, Europe, Asia Pacific, and Middle East & Africa. North America and Europe collectively expected to dominate the global dental irrigation devices market due to increasing awareness and geriatric population. However, APAC to show rapid growth owing to increase in number of clinics and practitioners and awareness about oral hygiene, adoption of innovative technologies and growing medical tourism. 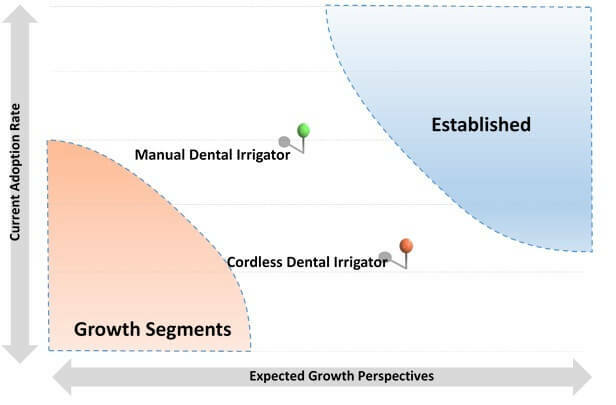 Examples of some of the key participants in the dental irrigation devices market are Water Pik., h2ofloss limited, Koninklijke Philips N.V, Panasonic Corporation, Jetpik, Oral-B, Shenzhen Relish Technology Co.,Ltd, Aquapick, Hydro Floss, Candeon Technologies Co. Ltd, Water pik, inc, Oratec Corp. The market sizing of veterinary dental products will be done by the adoption data triangulation approach. The demand-side approach will be followed to assess the actual market size of dental irrigation devices market. Secondary research will be performed at the initial phase to identify the feasibility of the target product/technology categories and its respective segments, product and service offerings, equipment installed base in end-use facilities, adoption rate and future impact of new technologies. Each piece of information will be eventually analyzed during the entire research project, which will help to build a strong base for the primary research information. The primary research participants include demand-side respondents such as veterinary clinics, procurement managers, as well as key opinion leaders in addition to supply-side respondents such as equipment manufacturers, service providers who provide valuable insights on trends, research application of products and technologies, purchasing patterns, services offered and associated pricing.